Isn’t it strange how unconnected incidents remind you of events. A passenger carrying frog leaping across my lawn brought my mind to bear on the Essex Steam Rally & Craft Fair held at Barleylands Farm Museum on the 21st and 22nd Sep 1991. I went over on the Saturday afternoon; it was an excellent day both for the event and the weather. I parked my car in one of the allocated car parks of which, there were plenty. The first ‘event’ to draw my attention was the army girls staffing the gates and a saucy lot too, in the nicest possible way of course. I then moved on to the carthorses and what a magnificent lot they were, so calm, strong and broad. They were the embodiment of the saying those who stand and wait also serve. The Barn Engines were set out like old soldiers on parade, the owners sitting behind them ready to explain their history at the first sign of interest. These ranged from about 1910 to the 1905s, magic names like Lister, Ruston Hornsby, Stuart Turner and the Petter A1’s, all in working order. Jim’s interest in his hobby started at an early age; “I was always interested in making things,” he said. “In my early days I made wooden boats and cardboard aeroplanes, etc. that was from about 1930 onwards. When I got my lathe in 1936, I started making tin plate boats, small steam engines and trailers. One of the nicest tin plate boats was a four foot tug boat called Gondia which I steam tested on Southchurch Park pond“. Building steam engines is a time-consuming hobby, each one takes about 12 months to build although Jim does manage to get some time in for his other hobby, beer tasting at our local the Rayleigh Lodge and the British Legion. Every now and then Jim will drop an object on the beer table wrapped in newspaper this is eagerly unwrapped and passed round for inspection, and of course, it is another mysterious and fascinating part of a steam engine. From time to time through the evening, this object will be picked up and respectfully turned in the hand. 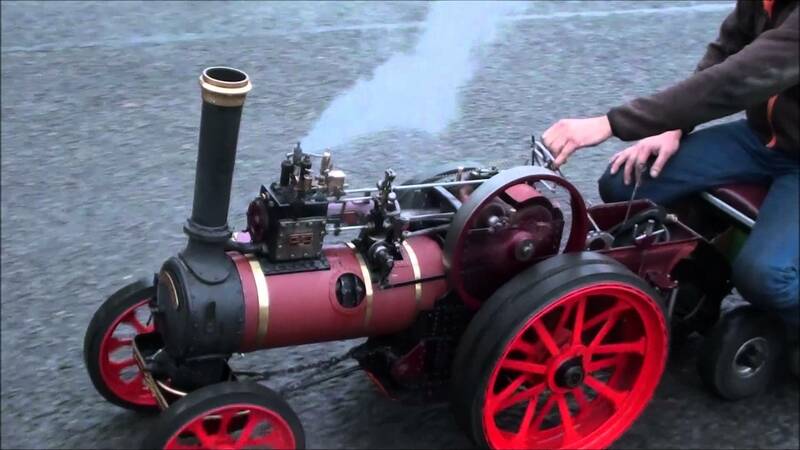 Since retiring in 1982, Jim has built eight traction engines and two rollers. Jim has won two shields for best model of the show, both at Thurlow and Haverhill. These were for a Ransomes and a Sims & Jefferies Light Road Tractor. I really looked forward to seeing the Marshall at Barleylands that year; especially as such; a lot had been christened over the Lodge beer table.